All aircraft requires an uninterrupted supply of fuel at all operating conditions. An Aircraft carry significant amount of fuel on board and its weight and movement should not negatively affect the control of the aircraft in flight. A basic fuel system consists of storage tanks, pumps, filters, valves, fuel lines, metering devices, and monitoring devices. All aircraft fuel systems are designed and constructed as per aviation regulations, requirements and guidelines. 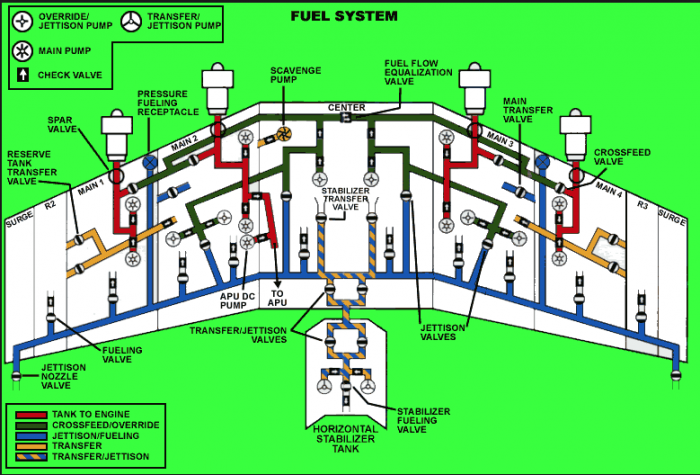 If a single fuel tank (or series of fuel tanks interconnected to function as a single fuel tank) is used on a multiengine airplane, independent tank outlets for each engine, each incorporating a shut-off valve at the tank, must be provided. Fuel system must deliver the fuel at the aircraft attitude that is most critical with respect to fuel feed and quantity of unusable fuel.